With more than a century of combined service to Emory and their communities, Cecil Wilson and Paul McLarty have each made innumerable contributions to improve the lives of others. 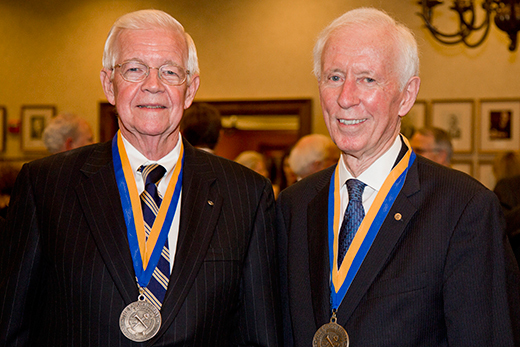 In recognition of their achievements, Wilson and McLarty are the 2015 recipients of the Emory Medal, the highest honor bestowed on alumni. Wilson graduated from Emory College in 1957 and School of Medicine in 1961. McLarty is a 1963 Emory College graduate and a 1966 graduate of the School of Law. The two were honored Oct. 29 at a ceremony in Governors Hall of the Miller-Ward Alumni House. "Each year we recognize our Emory Medalists for the contributions they have made and continue to make to Emory, to their communities, and to their colleagues and friends. This year, our esteemed medalists represent the fields of law and global medicine," says Sarah Cook 95C, senior vice president for alumni affairs. "Though their career paths may have encompassed unique specialties, each man shares an allegiance to serving others," she notes. "These accomplished alumni represent the core values of our university: courage, integrity and respect. We are honored to share in celebrating their achievements." "Being able to treat disease, to help people out, and to solve their problems was a very important part of what I wanted to be involved in," Wilson says of his career in medicine. Attending Emory was a family tradition, and Wilson believes his education at Emory was about "scholarship, the question of what you need to know, and how you learn how to find what you need to know." Fresh out of medical school with his high school sweetheart-turned-wife Betty Jane Webb Wilson 58C by his side, Wilson embarked on a distinguished career in private practice medicine and governance. His career was marked with pivotal moments. In 1967, the USS Pueblo was captured by North Korea and its crewmembers imprisoned. Upon their release a year later, Wilson "was part of the team which evaluated the crew as they came ashore." These early experiences with treating post-traumatic stress disorder shaped Wilson's perspective on the value of medicine. Upon completing Navy service in 1971, Wilson established an internal medicine practice in Winter Park, Fla. As his career progressed, "it occurred to me that, as a physician, just seeing patients wasn't enough. We needed to be involved with the system, the structure," he says. "I entered the field of organized medicine." As incoming president of the American Medical Association in 2010, Wilson reported on the passage of the Affordable Care Act. "What it meant was that tens of thousands of people were able to have insurance so they would be able to live longer, be happy, and work well. For me and all of the people involved in the AMA, this was a very important part of our participation," he says. Among other global leadership roles, Wilson served as president of the World Medical Association during which time he traveled to six continents, 16 countries and 26 nations. Through his public position in medicine, Wilson has exemplified leadership and service to communities around the world. His thoughts on retirement are clear. "I need to keep doing what I'm doing," he says. Empathy is a powerful motivator, and student needs have inspired McLarty to become a benefactor through scholarship, mentorship and leadership in law as well as in education. "We decided several years ago that our giving to Emory would be focused on scholarships," he explains. McLarty and his wife of 41 years, Ruth, established scholarships at Emory Law School and Emory College, and also contribute to the Emory Alumni Board leadership scholarship. "It's been really great to see kids get benefits from that," he says. Though he may have been an undergrad rock star in the 1960s with the band Mac Davis and the Fabulous Zots, he was accepted to the Emory Law School. "I decided to put my head into the wind and study and I discovered the Dean's List and places I hadn't spent much time before," says McLarty, who went on to become senior partner of McLarty, Robinson & Van Voorhies. "Through the years we've employed 26 Emory undergrads as paid interns in our office," McLarty says. "It's been great watching them grow up and succeed." The Emory chapter of Alpha Tau Omega stands as an example to the national fraternity due in great part to McLarty's involvement and influence. He now serves the ATO Foundation Board and has served as alumni adviser to the group for 25 years. McLarty invested time in rebuilding a previously failing chapter. Today, ATO at Emory consistently wins awards, and "since 2007 we have been our national organization's top chapter three times," he says. McLarty is the past president of the Emory Alumni Board and remains involved with university activities. He and his wife also enjoy continued contact with Emory students. "It keeps you on your toes," he says.